Mistakes are the most common thing which happens day to day in office environment. The real question is whether it is a minor mistake or a major mistake, which has a serious effect on your job. Amidst of continuous phone calls, popping emails, series of meetings it is natural you might miss out at something big once in a while. Have you ever felt your hands getting cold, heart pumping faster, or an adrenaline flush which gives a feeling of something struck in throat when you do something wrong?. Do not worry, there are two things which will follow. Good thing is that you are not the only person who have done a huge mistake. Bad thing is you have to face the consequences to overcome this mistake. 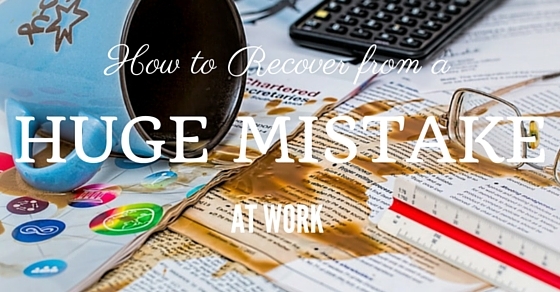 This post will help you to know how to overcome a huge mistake, committed at work. There are two things which you might bound to do after committing a huge mistake. The very first one is you might act too fast, say too much, apologize too quickly and over-complicate the issue. Other thing is you might hide it or you might tend to discuss with your fellow mates and you yourself might arrive at a solution. The worst thing which could happen is you might defend yourself and not accept the blame. None of the above is right, to face an issue committed by you. Here are few things a good manager might look at a person, and expect from a person who has committed a huge mistake. 1. They analyze how serious the mistake is, and compare the true seriousness of the issue. 2. They tend to analyze why it has happened in first place, what situation led to make this happen. 3. They also like to listen to you about the remedies that can be done to overcome the issue. And also will expect your assurance that the issue might not happen again (there are chances it might happen in the future, but they expect positive vibes from you). To commit an error is human, and we often after committing a mistake lose confidence, imagine lot many things than the reality and finally end up doing more than what is needed. Here are the few basic things which has to be minded to avoid the damage caused by the mistake in your career. This is a very important note, and it might seem not so big thing. But, it is. Body language is something which speaks before you speak. Hence, make it a note to keep your body language positive. Never show you are totally drained by the issue, and also do not show you don’t care and you are frustrated. Keep yourself sorry about the issue, you are concerned about it. You should portray yourself confident as well as concerned. If you have done some mistake, you will surely know it is a mistake. People try to showcase that they have done something wrong, to shield themselves from facing the consequences. This will never reduce the heat rather, it will incorporate more troubles. If something has gone out of the way in your job, other people who are involved in your team or your boss is going to be affected. Hence, it is better to immediately bring it to notice rather asking more apologies for delaying the issue. It is natural to feel insecure, worried, and feel very scared to accept the trouble. But remember more you hide, more the stress, more the consequences and of course more monetary losses to your organization. You might also think let us take time fix by ourselves, this will surely go wrong of two reasons. Either you get screwed for not letting know it to the higher authorities or issue gets doubled and causes more issues. You might feel more threat about hiding, than the issue. So always keep in mind to be honest and own the mistake immediately. Once you have approached your boss, try to stick to the issue to the point rather than cooking up stories. When you tend to explain more, you might miss out the original issue and make the boss feel more frustrated about your behavior and your mistake. It is natural to get panicked while explaining the issue, but remember the way you put the issue only reminds in your boss mind than the original version. Try to be positive while speaking, and do not stress on the consequences by yourselves. It might be less than you have imagined right?. So, do keep the point in a humble tone than cooking up stories on a nervous note. Putting the blame on a third person or on the time limit is very dangerous. This will only make your boss more humiliated than feeling responsible for the issue. Never try to move away showing hands towards others when an issue arises. Try to be more committed and responsible for the mistake. This will hold your respect as well gives confidence about you and surely you will be trusted for an another chance. So, remember giving excuses or blame game will never help from moving away from the mistake. In order to survive from the mistake, it is essential to be on time and more appropriate it is good to be before time. The very first step to get away from the bad image is to be on time. Always make sure from that point, you work beyond your time limit, to showcase your skills. This way, it shows you are committed for your mistake not only by words and also by your actions. Try to work more on time as because the more early you do your work, the more control you gain over your last issues. It is to be sure you are going to be under watch after you commit a mistake. So, why to be late? Do your work on time more consciously or will be better to do before time. Being sorry will not work only by words. It has to proved. Always look for a chance to show you really feel sorry by doing hard work. Working extra hours, taking more responsibilities in others tasks assigned to you will speak your apology for your mistake. This is not only to impress the crowd, but to make the crowd know that the error that occurred was by mistake. Working hard is the only way to make people appreciate you, and forget your mistake. It is very difficult to accept and keep talking about the mistake through mails, or by person. But remember, once when you fear to face the emails or your boss it will make the situation more awkward. It is natural that people will think that you have lost your grip on the job. So, never take things so serious and shy away yourself from communicating the scenario. Be positive and timely in your communication. Even if you feel that you do not have an reply, for the point put forward towards you try to put it in humble words. For example, you do not have an answer for an email. You can put a mail like this kind. This kind of appropriate response would make the person on other end feel respected, and you are also alert and concerned about the scenario. A get back email is a very good etiquette to be followed in office environment after all. For example, when your manager intends to talk about the consequences he is facing over the issue, never be so interrogative to his/her words. Try to be supportive and help them to face the issue along with you. Remember, they are the people who are been targeted for your sake. So, try to be responsible and counterpart by also helping in their other jobs as well. It is natural that you might face the scrutiny for sometime. These are the times were people might throw some harsh words or indirect target on you. Never feel very bad about it, rather try to face it overcome the situation. Time will surely heal, so remember this is not going to be forever. The more you face, people will get tired of scrutinizing you. After all human beings commit mistake. At the end of the day, it is a mistake committed by you in your career. When the consequences are really unimaginable. Never panic. Try to push yourself to the reality and move on. World is full of opportunities. You have to get down and face the reality. It is for time being you suffer, the more confident you are the more you win. Do your job and rest will happen by time. An organization only needs people who are confident and positive. After all, end of the day all the people who have come to work make mistakes. It is how you face individually really matters. There is always a come back for anything we do in our life. Remember history have many successful people who have committed mistakes in life. So be never too isolated or very detached for your mistake. Anything and everything has a solution. Remember the above the points, and follow it to win the troubles.